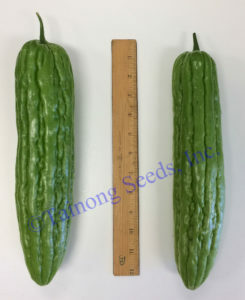 Bitter Melon 苦瓜 | Tainong Seeds Inc. 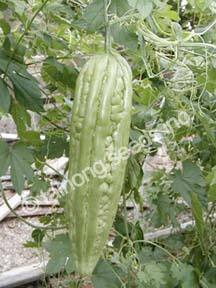 Bitter melon comes in a variety of shapes and sizes. 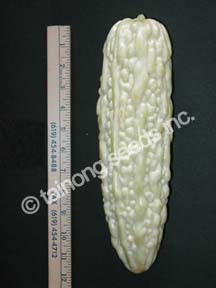 The Chinese variety is 20–30 cm long, oblong with bluntly tapering ends and pale green in color, with a gently undulating, warty surface. The bitter melon more typical of India has a narrower shape with pointed ends, and a surface covered with jagged, triangular “teeth” and ridges. It is green to white in color. Between these two extremes are any number of intermediate forms. Some bear miniature fruit of only 6–10 cm in length, which may be served individually as stuffed vegetables. F1 Hybrid Green Giant NEW!!! Fruit weighs about 500 grams each. 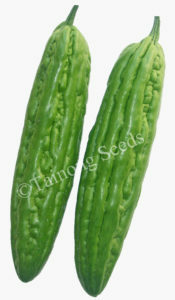 Easy grower & highly productive. Big, heavy, emerald green fruits with smooth, shiny, warped skin. Approximately ~12 inches long and ~3 inches in diameter. Excellent O.P. variety with big, medium green fruits. Approximately 8 ~ 10 inches long and ~3 inches in diameter. Best in warm to hot areas. Leaves are also harvested for Southeast Asian delicacy. 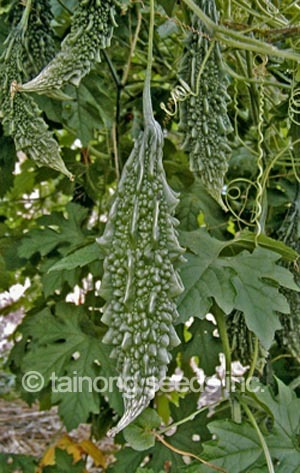 Produces many small, dark green fruits with spiky, warty skin; ~5 inches long and ~2 inches thick. Very heavy with smooth, white warped skin. 10 ~ 12 inches long and 3 ~ 4 inches in diameter. 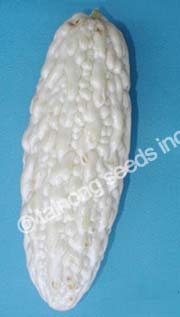 Beautiful, medium sized white fruits measuring 7 ~ 9 inches long and ~3 inches in diameter.